Would you like to learn about a substance that can improve sports performance, rev up your metabolism, enhance speed, increase strength and positively impact cognitive function? No it isn’t the latest magic formula from the supplement industry, it’s WATER! Water is not only important in numerous bodily functions but when utilized properly can enhance athletic performance. When dehydration begins, even a 3% drop from optimum fluid levels may cause an 8% loss in a muscles contractile strength as well as a 10% loss of speed. Dehydration can even negatively impact cognitive function, on or off the playing field. I feel that most people, including athletes, are not properly hydrated. By over looking this simple but powerful substance you may be holding back your sports performance as well as contributing to daily discomfort from other problems. So before you drop a boat load of cash on the latest miracle supplement from the bodybuilding nutrition “experts” or grab another box of those purples pills; make a concerted effort to become properly hydrated and stay that way. I am confident that you will notice the difference. *This article is not a recommendation to stop any prescribed treatment you may be undertaking with the care of your personal health care provider. I gave this circuit a test run with a client on Tuesday morning. We started off the workout with a series of sprint intervals up a shallow hill, so she was a little fatigued going into it, but regardless, the circuit is pretty effective. 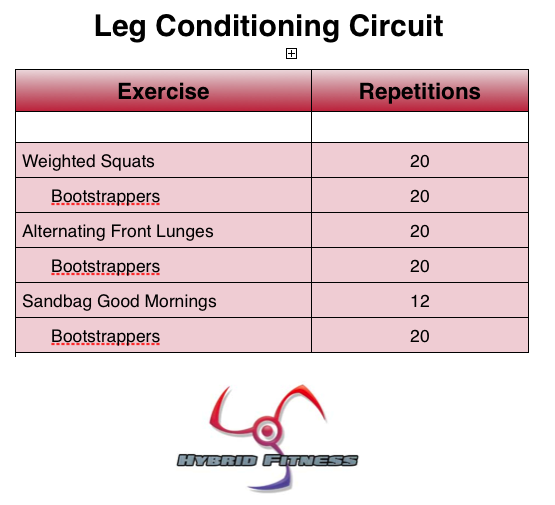 Start with one time through the circuit, taking little to no rest time between exercises. Rest a couple minutes, then go through a second time. Although you’re not trying to necessarily fly through the exercises as fast as possible, you should keep a brisk pace and be able to complete everything in under 3 minutes. One of my mantras in life is to always look for and try something new. A particular kind of food…a new sport…a new destination…whatever it may be. Well recently, I had the opportunity to try something new. My wife tried to get me to take a water running class. Who am I kidding…it was Water Aerobics. Unfortunately for me, I had a number of business issues to take care of, so I let her have at it. Now, you might think a class like water aerobics is full of older ladies who like to talk about the last few episodes of Oprah. And if that was your impression…you’d be right. But, the class also had it’s fair share of 30-somethings as well as a couple of fire fighters. Quite a varied mix of participants. Like most activities, water aerobics can be as hard as you want to make it. In this particular class, they give you a flotation belt, then have you “run” laps in the pool, do various strength training techniques on the side, etc. Basically, they keep you moving for a good 45-50 minutes. Well my wife, being the hardest working woman I know, opted to not use the flotation belt. This took the intensity of the activity and immediately shot it through the roof! I’ll point out that she was the only one in the class who did so. Not to make you other fire fighters in the class look bad, but….I’m just sayin’. To her credit, she’s a former water polo player, competitive swimmer, etc. so she was up for the challenge. To make a long story short, she came back raving about the class and talking about how challenging it was. Having done my fair share of water-based sports, I can attest to the difficulty involved. Moving through water is far different and infinitely more challenging than moving on land. Needless to say, she sold me on the class. The next chance I get, I’m jumping in the pool and doing some water aerobics. I guarantee my wife will make me look like a beginner, but I’ll check my pride at the door and give it my best effort. My point with this post is to try to get all of you to try something new and always challenge yourself. Take the next opportunity to sign up for a class or sport that you’ve always been interested in, but never had the guts to try. Remember, too, that no matter how easy it sounds (*ahem*…water aerobics) there are always things you can do to make it more challenging and certainly worth your while. So stop reading, get out there and try something new. By now most of you know that I am a minimalist when it comes to my strength training program prescriptions. My goal is to find the least amount of volume that will trigger the maximum growth response. This must be determined on a case by case basis as no two individuals are exactly alike with respects to recovery ability, health, nutrition, injury status etc. Some of the workouts I create appear quite simple on paper but as many have come to find out, looks can me deceiving. After all it is not the weight you lift but how you lift the weight which determines your ultimate outcome from any training program. When you give your all to a handful of sets you will quickly find that no more is needed. Today I am going to outline a brief but challenging upper body workout. It is comprised of five pairs of opposing push-pull exercises. that’s ten total sets for your entire upper body. There is no direct arm work but believe me your arms will get plenty of stimulation from this program. You may begin with any paring as long as you proceed from that point in the workout forward. There are two ways in which to begin this program. First; you can start with a paring that has movements that are challenging for you or which represent areas of your musculature that you feel need work*. Second; you may start with a different paring every workout. This will allow for longer periods of progression with less likelihood of adaptation plateaus (provided you are recovering fully). The entire workout should take approximately 16 minutes to complete if you are working hard. This assumes that each set will take roughly 60 seconds to complete and that you will rest 90 seconds after each pairing. I suggest that you do all of your warm-up work before hand and then proceed through the bulk of the workout using maximum resistance for each movement pairing. Choose a weight or resistance level that you feel would be challenging to perform 6 repetitions with. Then do your best to achieve 8-10 repetitions on each set. Do not terminate the set at an arbitrary number, continue until no further repetitions can be completed with perfect form. Besides the 90 seconds rest intervals between parings, strive to keep rest to a minimum and move quickly from one exercise in a pair to the next. Write down your start and finish times (excluding warm-ups) as well as the repetitions completed and the resistance levels used for each movement. When you can complete 10 reps or more with perfect form then bump up the resistance by 5%. Give this “Around the Clock” workout a go and see if you aren’t getting everything you need for your upper body from this very brief but intense plan. *If you do this I recommend that you still switch the order every 3-4 weeks or so to avoid adaptation plateaus.